X7R BME Ceramic Capacitors are tested to MIL-PRF-32535 standards. X7R Base Metal Electrode Multilayer Ceramic Capacitors are offered in case sizes ranging from 0402-2220 and are rated for 16-100V and 2.2nF-22μF capacitance. Units are suitable for applications such as space and satellite communications and launchers, military aircraft, and defense, weapons and radar systems. These units feature FLEXITERM® termination technology that provides protection against thermal and mechanical stresses. AVX Corporation, a leading manufacturer and supplier of advanced electronic components and interconnect, sensor, control, and antenna solutions, is the first — and currently only — company to offer space-level, X7R base metal electrode (BME) MLCCs with “M” and “T” reliability levels approved to the Defense Logistics Agency’s (DLA’s) MIL-PRF-32535 specification. 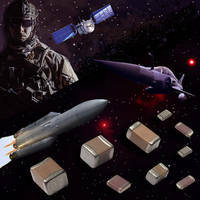 Exhibiting high CV capabilities superior to those of precious metal electrode (PME) MLCCs, which have long been the standard for the global aerospace industry, AVX’s leading-edge, space-level, X7R BME MLCCs deliver a 39-fold increase in capacitance compared to standard, 100V, 1812, MIL-PRF-123 and MIL-PRF-55681 MLCCs — enabling revolutionary board space, weight, and component count reductions that directly translate into lower launch costs — and meet extremely stringent DLA requirements for high-reliability performance in space applications. The series also features AVX’s patented FLEXITERM® termination technology, which allows for more board flexure than standard terminations, providing proven-effective protection against thermal and mechanical stresses both during assembly and throughout component lifetimes and enabling the safe, reliable employment of large case sizes.